Here’s a new (?) 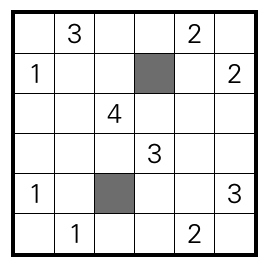 Sudoku variant. Inspired by Sudoku N from the upcoming Sudoku Mahabharat. 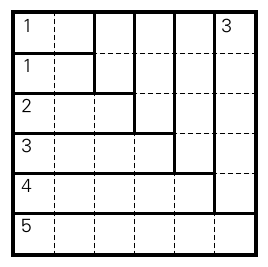 The 6×6 example there also solves uniquely by these rules. 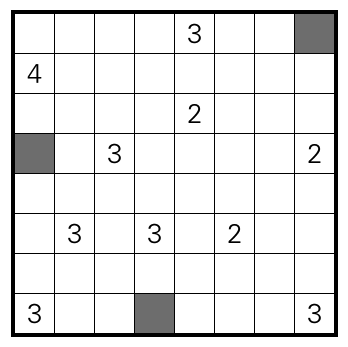 Rules Solve as a regular Sudoku. Some pairs of numbers are friends. Dots mark all spots where two friends are next to each other. This entry was posted in Puzzles and tagged easy, friendly sudoku, sudoku, variant on 2018-04-26 by rob. I played around with what I thought were the rules to Oasis today, and came up with this variant. Rules Shade some cells, to leave a connected area of unshaded cells that includes all given numbers and doesn’t cover any 2×2 square. Some shaded cells are given. 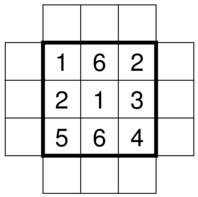 Numbers indicate how many other numbers can be reached through unshaded, unnumbered cells. This entry was posted in Puzzles and tagged easy, medium, not oasis, not practice on 2016-10-11 by rob. Just a tiny puzzle that I made as an example for the croco WPC preparation series. It was a bit too hard as an example; the type seems inherently hard. Rules Place some lamps in the empty cells around the grid, with brightness 0 to 3. The lamps shine horizontally, vertically and diagonally in eight directions. In each direction, they illuminate as many cells as they are bright. 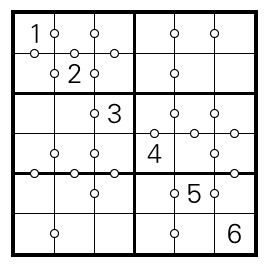 Numbers inside the grid indicate how many lamps illuminate the corresponding cell. The WPC instruction booklet has an example. This entry was posted in Puzzles and tagged easy, lamps, practice on 2016-10-10 by rob. Here’s a puzzle for one of the types on the Keller round, with superimposed puzzles. 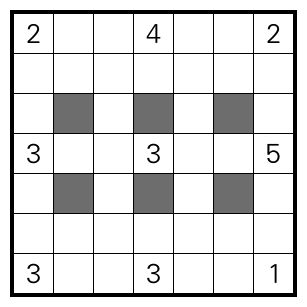 Rules Solve the left grid as a Mosaik. That is, shade some cells, such that each number indicates the number of shaded cells in the surrounding cells, including the cell itself (so, 9 is the maximum clue). Solve the right grid as a Magic Labyrinth with digits from 1 to 3. That is, place digits 1, 2, 3 in some cells such that every row and column contains each digit exactly once, and walking along the labyrinth from outside to inside, you visit digits in the repeating order 1,2,3,1,2,…, starting with 1. 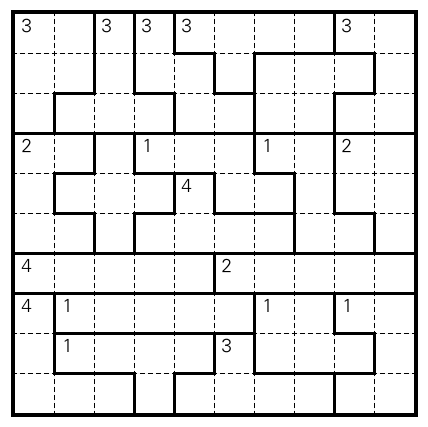 The two puzzles interact: Whenever a Mosaik clue is shaded, copy that clue to the Labyrinth in the corresponding position. This entry was posted in Puzzles and tagged easy, hybrid, keller, magic labyrinth, mosaik on 2016-06-19 by rob.